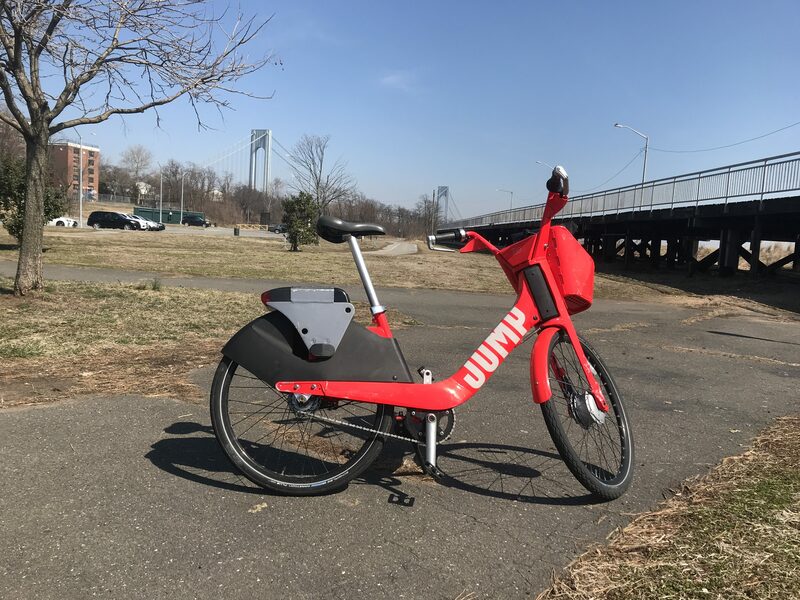 There is no better pedal-assist e-bike than the Jump bikes that are being tested in Staten Island and the Bronx — except when the power cuts out and suddenly you’re at Lily Pond Ave. and McClean Ave. on The Rock and have to wait 20 minutes for an S51 to take you to the ferry because there’s no other dockless bike anywhere nearby. Yes, we were on Staten Island yesterday (finding more reckless cops). So here’s a reminder: Just because a Jump bike says it has 77 percent power doesn’t mean it’s going to take you up Father Capodanno Boulevard to the ferry. Just sayin’. Hat tip to the Verge for breaking a big story that the Brooklyn Navy Yard is testing driverless shuttles. Manhattan Borough President Gale “Cars Need to Double Park” Brewer will be hosting her public hearing on congestion pricing tonight at Cooper Union. The Times decides that subway lines bearing letters instead of numbers are doing much worse. Patch had a nice story about straphangers singing Jackson Five songs during a delay. The Post offered its belated review of the Museum of the City of New York’s “Cycling in the City” exhibit. In case you missed it, the West Side Spirit looks at the danger of left turns. Left unsaid: the danger of cars in general. what? doesn’t a powerless ebike have pedals? what am I not getting? Since I’m assuming that Jump is bragging about its range it’s 77% more energy, not power. Again, I was told that 75 years is the “drop dead date” for conventional signal systems. NYCT has replaced signals at a 60 year rate — except for the 1970s and the past decade, when soaring debts and pension costs caused ongoing replacement to stop. The subway was built, aside from the odd short extension, between 1900 and 1956, when the Rockaway Line was added. The 1954 bond was supposed to go to the Second Avenue subway, but it went to second generation equipment on the IRT instead. The entire IRT now has second generation signals. Not so the IND and BMT (lettered lines) and some of them, mostly on the IND (A-G) have gone past 75 years. The are expected to fail all the time. But since NYCT is so far behind, it is inevitable that the IRT will follow, because it will become overdue for a third system. First to collapse would be the original subway — from Brooklyn Bridge to Grand Central and from Times Square north to the Bronx. Of course that will screw up the entire lines. re: Congestion Pricing. 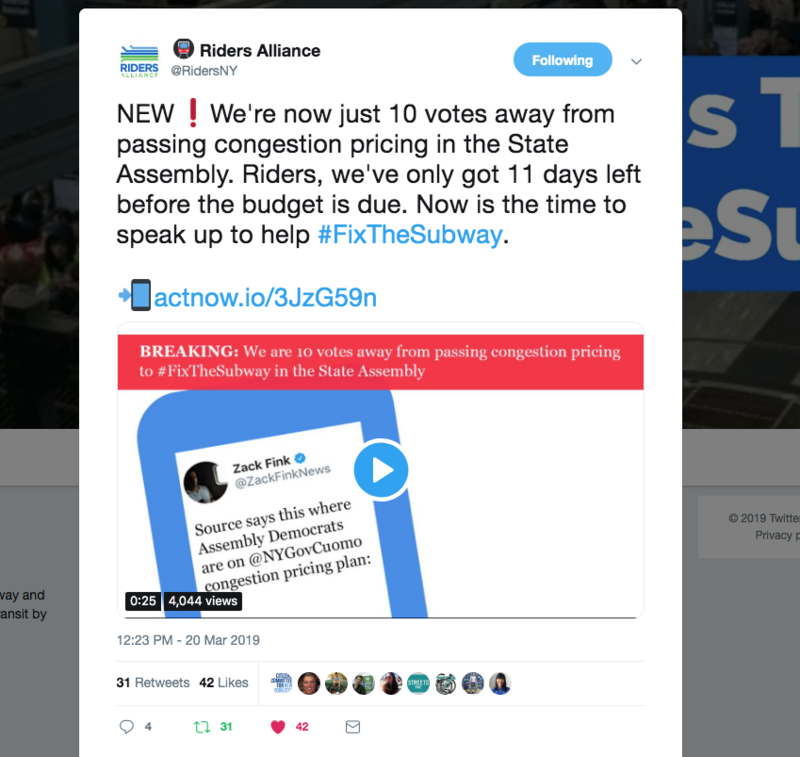 Got an e-blast from Riders Alliance saying only 10 more Assembly members needed to pass that chamber. Anyone know who the holdouts are? Cyclists (in Manhattan at least) are pretty aggressive about left turns. Even if a car is ahead of them and has already begun its left turn, the cyclists will still rush headlong into that blind spot and try to force that car to yield. Most of the time, it works. I would never ever take that option though. I will never try to swerve around the left side of a car that is seeking to turn left. You crazy motherfuckers. oh i have. it’s not that hard. Let’s not forget there is one of these signs at every turn across a bike lane, across the whole city. I understand the law and I understand driver responsibility, and who has right of way (cyclist). I am merely expressing a personal opinion and preference. Drivers who misjudge a turn face a choice of being slammed into by a very hard SUV or truck or slamming into a nice soft cyclist they “didn’t see,” and then making a run for it. Agree. But in those cases, I feel it’s both safe and more efficient for the cyclist to pass on the car’s right side. They’re not designed to be pedaled without some level of assist from the motor. When the battery is dead and you pedal, the motor acts as a generator and recharges the battery. This basically means there’s a heavy load. Probably Lance Armstrong couldn’t get an e-bike with a dead battery past 10 mph. Some e-bikes might have a switch to break the circuit between the motor and battery, but even then the motor still represents a load due to the brushes, bearings, and gearing.